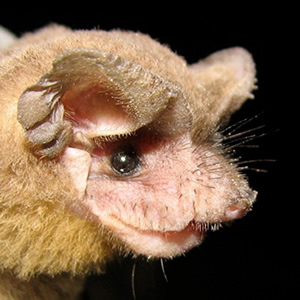 The Brazilian free-tailed bat is in the family Molossidae, from the Greek molossus, or “mastiff,” named for its dog-like appearance. These bats are called “free-tailed” because their tail extends beyond the edge of the tail membrane. Most other bats in Florida, including the Southeastern bat, are in the family Vespertilionidae with the tail membrane extending to the tip of the tail. The subspecies found in Florida and the Southeast is Tadarida brasiliensis cynocephala. The Latin term cynocephala is translated as dog-headed. Although related to the Mexican free-tailed bat, famous for the millions that live in Carlsbad Caverns in New Mexico, the southeastern species differs in two ways: it does not migrate and isn’t usually found in caves. The Brazilian free-tailed bat occurs statewide and is one of the most abundant native mammals living in Florida’s urban areas. The bats form colonies (from as few as 50 to many thousands) in man-made structures like buildings and under bridges. Free-tails are a medium-sized bat (7-14 grams) with brownish-gray fur, and have a distinctively musky odor. It is often possible to smell a colony of free-tails downwind from half a block away. Free-tailed bats are strong fliers with narrow wings, and can fly independently at more than 25 mph. The bats forage as far as 25 to 30 miles from their home at night and return each morning before dawn. Free-tails have been found at altitudes up to 9,000 feet, traveling at speeds up to 60 mph in strong tail winds. Southeastern bats share the Bat House with the free-tails. The Southeastern Mouse-Eared Bat, Myotis austrioparius, is a small bat (6-10 grams) with woolly-brown fur. The scientific name means “mouse-eared bat of southern streams.” This bat primarily winters and has its maternity colonies in caves, but will also roost in storm drains, bridges, buildings and bat houses. These bats are unusual in that they typically have twins rather than a single pup, giving birth in early May. The Southeastern Bat has broad wings for slow acrobatic flight. These are the bats seen flying over the fields before the masses of free-tails emerge. Evening bats, Nycticeius humeralis, also share the Bat Houses. While fewer evening bats occupy the UF structures, it is one of the most common species found in Gainesville, and is abundant throughout the southeastern U.S. This bat is dark brown with black wings and ears, and typically forms nursery colonies in hollow trees, behind loose bark and sometimes in buildings and attics. Evening bats in the northern part of their range are believed to migrate southward in the fall and remain active at their over-wintering sites. Bats utilize a sophisticated ultrasonic system of navigation and finding prey known as echolocation. By emitting high-pitched sounds (inaudible to human ears) from their mouths and monitoring the bounced sound waves with super-sensitive ears, they locate and eat flying insects at the rate of up to 1,000 per hour while navigating through woods, around buildings and people, and avoiding collisions. Bats also emit a wide range of sounds audible to humans known as “colony chatter,” a sophisticated form of communication between members. Bats are the primary predator of night-flying insects in the world. Their contribution to natural, biological pest control is tremendous. At least eight species in the western U.S. are pollinators, but bats play a much larger role in pollination and seed dispersal for many fruit trees in other countries. Bat manure, or guano, is a superior organic fertilizer containing many valuable micronutrients and naturally occurring soil microbes that aid in plant nutrition.